So I just got the memo about November being Blog month. It’s the 8th and already I have missed 7 days. And I can guarantee I won’t be blogging everyday, but I’ll do my best. The knitting has gone stealth again but I’ll see what I can find to share. Not to worry there are many other distracting photos. 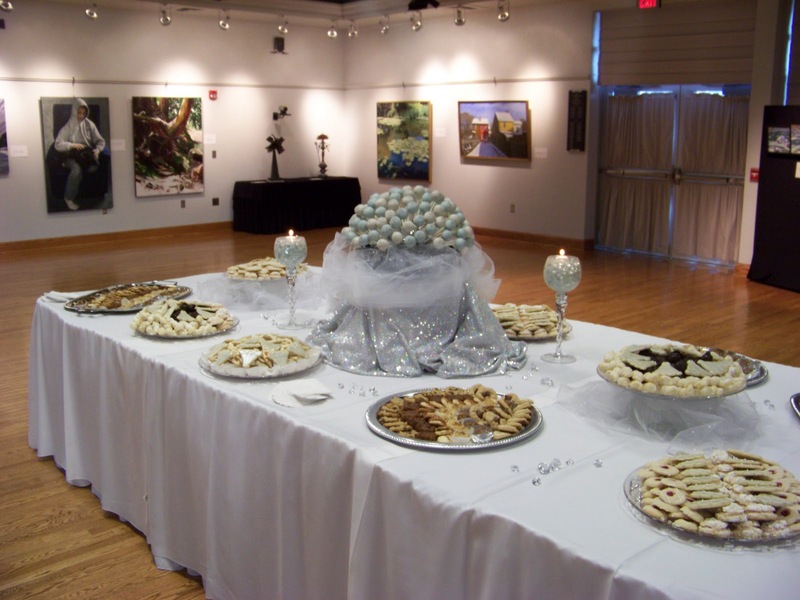 I was the Co-Chair of the Greater Latrobe Art Trust Gala this year. Greater Latrobe School District, where I am a school Board Director, has been collecting art for 75 years. Every year student leaders and art students scour the local area for paintings to bring back to the school for the entire student body to vote on. The student council then purchases as many of the top five choices as their budget allows. 75 years folks, this has been happening for 75 years!!! So you can imagine the collection that has been amassed in all those years. The art hangs on the walls in all the hallways of the high school. There are over two hundred pieces in the collection now. About 20 years ago the school districts solicitor and his wife spearheaded an effort to raise funds to restore and conserve the collection. The Art Gala raises funds for the ongoing conservation. The collection was recently recognized in American Profiles magazine (you know the magazine inside your Sunday papers). Ever since we have had people from all over the country calling and requesting tours of the collection! Anyway, the Gala, was a huge success, with over 500 people attending. It was a long couple of days for our committee but isn’t it beautiful? I am sorry I don’t have any photos of the collection or after everyone arrived all decked out in their finery, but I was a busy girl. 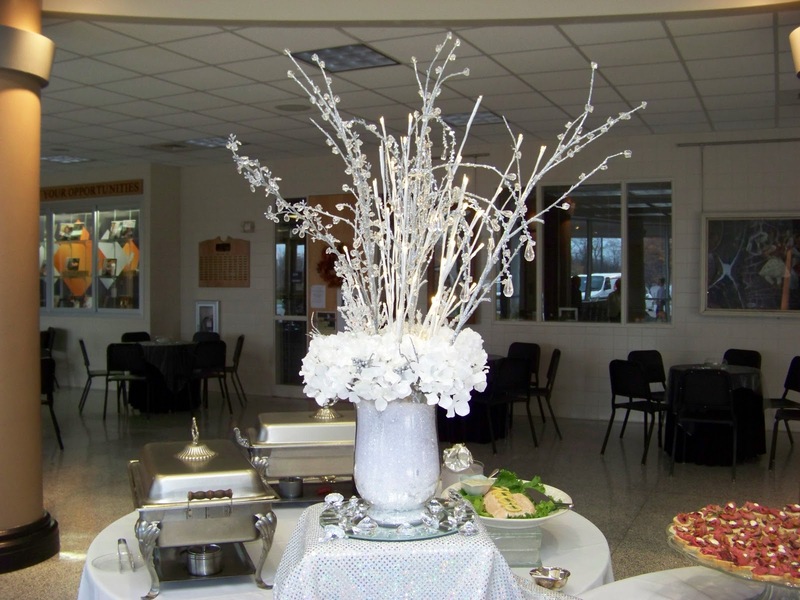 A centerpiece on the caterers tables. This area is the commons or central meeting area at Greater Latrobe High School. Through the distant windows you can see the courtyard. But what was most impressive to me was the cake pop centerpiece. I worked a while on this baby figuring out how to make it pretty and practical (isn’t all life like that???) 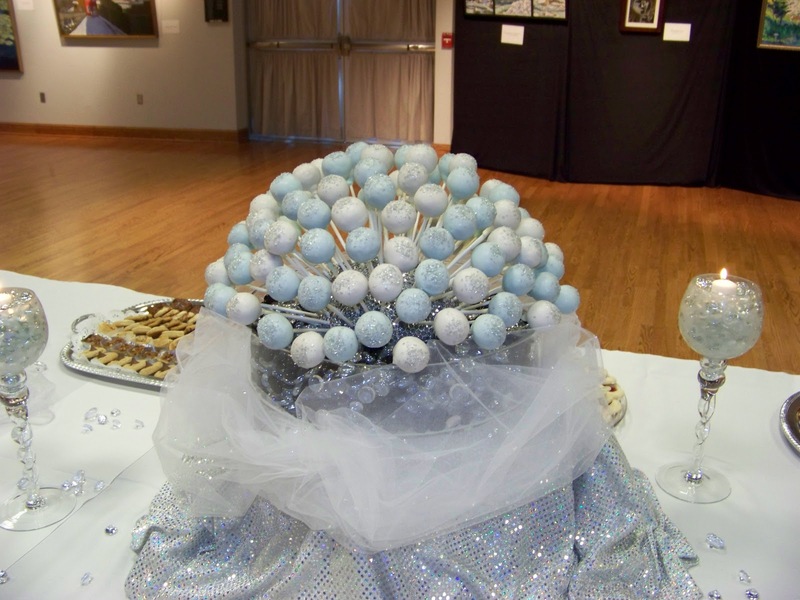 The pops were dipped in white and pale blue icing, sprinkled with sparkles. And they really sparkled. We worried people wouldn’t know to eat them, so not a problem. They were gone in an instant. The Center For Student Creativity is an amazing space. A collaboration between the school district and the Art Trust, the Center is a gorgeous facility outfitted with the latest in audio visual, art and performance spaces. It also functions as a community center as the community is invited to use it whenever the school is not. 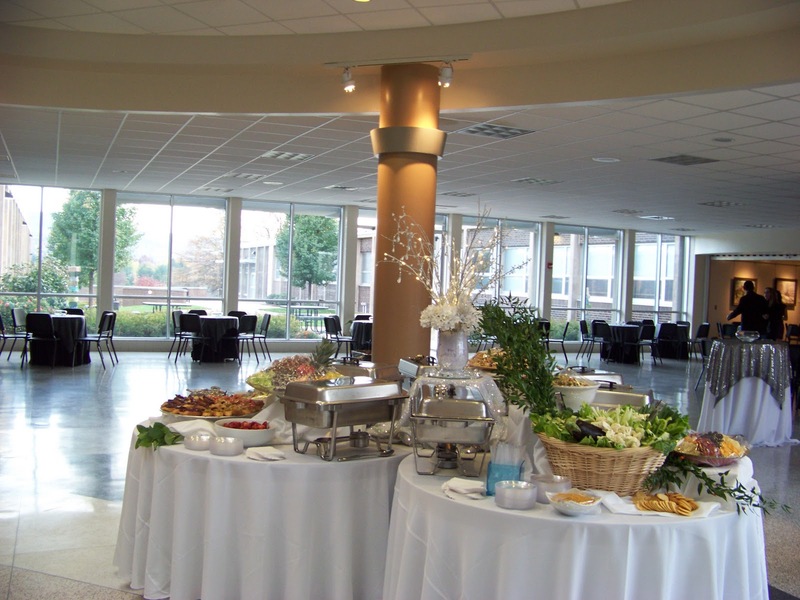 We show foreign films for seniors here, many people schedule bridal and baby showers here. It is a beautiful space and it is an extension of the art wing of our high school, between the art rooms and music rooms. Arnold Palmer and Mr. Rogers are both distinguished alumnus and the Center is part of a beautiful neighborhood. Check out the article in the link above. It really is kind of amazing. 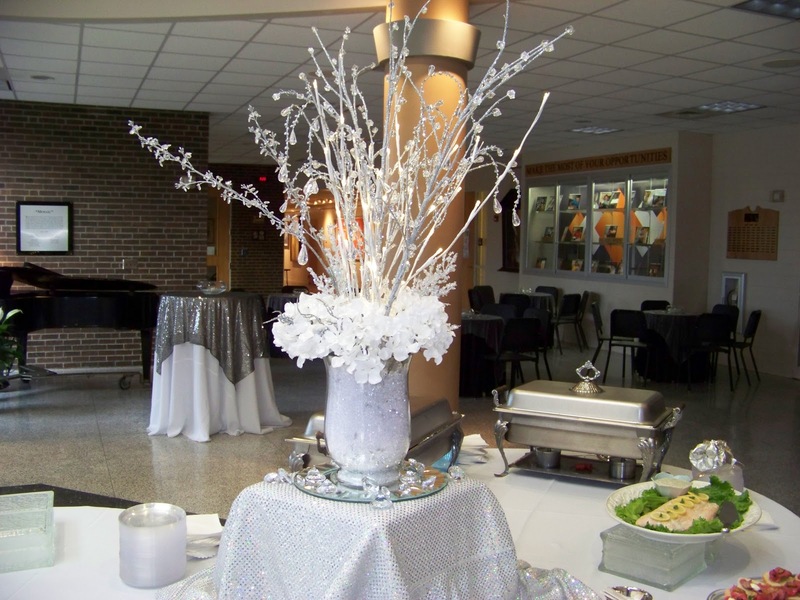 The tables and cake pops look great! Being in Latrobe, you may not be able to get the vodka, but…Rolling Rock, right?